This book, by Holly Lisle, was pulled from the iBookstore for "mentioning" Amazon. The thing is, I made a conscious choice for Andrea (my protagonist) to be a Kindle user — just like I made a conscious choice for her to live in a two-bedroom apartment, own two cats, not have a car, use an Android phone, and rarely (if ever) wear high-heels. More than a thousand little things have gone into creating this character that I hope someday will grace the screen of your e-reading device of choice (or be an actual book you hold in your actual hands), and the technology she uses (and doesn’t) is a big part of that. I’m sure if you do some googling you can find articles comparing iPhone users to Android users, Kindle users to Nook or iPad users, Mac users to PC users, and so on. It’s not difficult. And I’m sure you yourself have reasons for using the technology you do. I certainly have reasons for owning the devices I do, from my phone to my computer to my car to… hell, to the blender I use to make smoothies in the morning**. The same with Andrea. 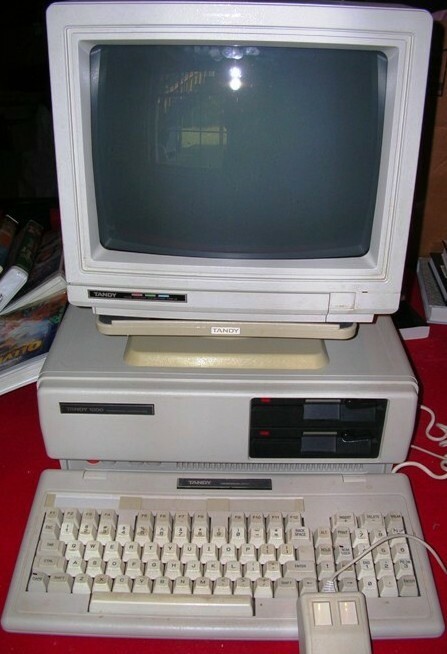 This looks almost exactly like the Tandy 1000 I had in 1984, except that mine only had one floppy drive. Plus, getting back to the Kindle thing — they’re absurdly easy to use***. My grandmother, who is in her 80s, adores her Kindle. She rarely uses her computer, but she can find, download, and read books on that little device — which has more computing power in it than my first desktop PC****. If my grandmother uses a Kindle, then it truly is a ubiquitous device. Why shouldn’t Andrea use one too? But if a novel where the main character uses a Kindle could get kicked out of the iBookstore for simply mentioning an Amazon product*****, what’s next? Will Andrea’s use of an Android phone force iPad users to buy my book using the Kindle or Nook app? Or, if Apple should get into a partnership with Toyota, who’s to say a future novel where the character drives a Nissan wouldn’t cause problems? And this could go the other way, too. Remember, Amazon will sell you a discounted Kindle with “special offers” — what if one of those offers conflicts with something in a book? What if it’s Amazon who has an exclusivity deal with Target and I decide that a character shops at (or works at) Wal-Mart? I think it’s less likely for Amazon to pull a stunt where they dump a book for mentioning a competitor, but it’s certainly possible. See, we as consumers have to remember that companies can choose to sell whatever products they want. Private companies have the right to carry the stock they think best suits their product, image, and ability to sell. Clothing stores do it all the time. So do grocery stores. I mean, look at the differences between the stuff you can buy at a “gourmet” grocery store compared to the stuff you can buy at a store you might see on any busy corner. They make choices, and they have the right to make those choices, because they’re private businesses. So too does Apple have the right, as a private business, to choose not to carry a certain book for whatever reason they wish. Same with Amazon. Same with Barnes & Noble. Same with Waterstone’s. So what happens when authors start having to account for these new revenue strategies? My best guess: multiple versions of the story — B&N gets copies of my book where Andrea uses a Nook; on Amazon, she has a Kindle; on iBooks, she has an iPad. Copies being sold through Amazon have her using an Oster blender; copies sold through Apple have a Hamilton Beach unit; if the book should show up in Nordstrom’s, maybe it’s a Cuisinart. To hell with artistic integrity — if I want to sell my book to the most people possible, I have to change the character so she uses the right products to fit the market where I’m hoping the book will be sold. 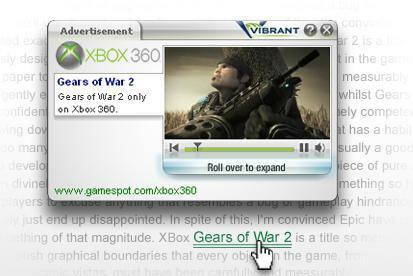 Vibrant is one of several companies that automatically highlights words so that, when you hover over them, you see an ad. This happens a lot in television and film — characters who, in the script, have a cup of coffee might suddenly find themselves holding a Starbucks cup. Perhaps a “black shirt” becomes a “black Polo shirt”. I seem to remember back in the 90s talk of technology where a user could point a device at a TV screen and find out what Rachel or Phoebe was wearing on Friends, along with links to buy those clothes at various retail outlets; who’s to say that’s not coming to books we consume on e-readers? Let’s not forget that Callie in Death’s Daughter constantly name-drops clothing and shoe manufacturers; imagine how much additional revenue ebook producers could make with a link-sharing deal? It’s already happening on news sites (those annoying contextual links that pop up ads when you hover over double-underlined words); why not in books too? There’s already a bunch of issues surrounding e-readers, e-bookstores, and e-publishing. 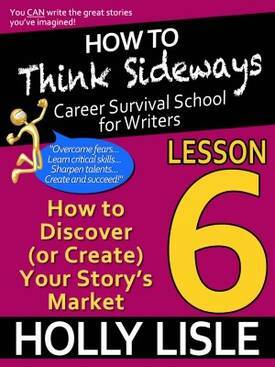 Here’s another one that authors are going to have to seriously consider as they write and edit their books. * Not because of the device; because of what she’s reading on it. ** It wasn’t terribly expensive, primarily. I didn’t say all the reasons were good, just that they existed. *** This is not an advertisement. I make no money from this. I’m simply stating a fact. **** Tandy 1000. 128k. 5.25-inch floppy drive. No hard disk. 16-color monitor. Dot-matrix printer with interchangeable color ribbons. In 1984, it was AWESOME. ***** Full disclosure: I haven’t heard of any books being kicked out of the iBookstore for simply mentioning that the character owns a Kindle. For all I know, it may never happen. I’m just trying to make a point here, is all.